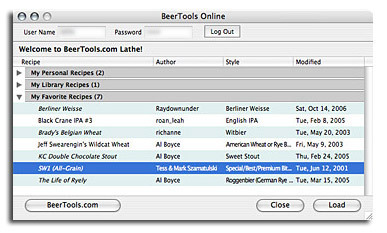 The tools at BeerTools.com are now augmented by the BeerTools Pro application. This does not mean that development on BeerTools.com will stop. The role that BeerTools.com now plays, however, is changing. From the beginning the site has been a central meeting spot for development of recipes and discussion about them. With the arrival of BeerTools Pro (BTP), BeerTools Online (BTO) has started to take on a new role. 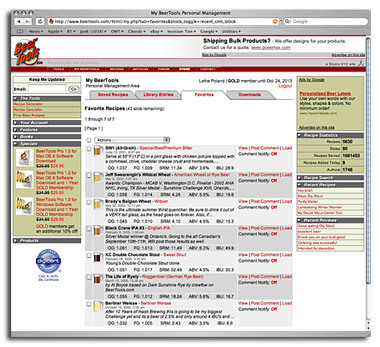 BTP has the ability to download recipes contained in the BTO database. For the purposes of this article we will assume the user has a GOLD membership. (NOTE: a GOLD membership is NOT required to be able to download recipes into BTP. There are limits for non-GOLD users however.) Lets start with the website first. Go to the "MY BEERTOOLS" tab. After logging in you will notice four tabs. Saved, Library Entries, Favorites, and Downloads. The Downloads tab is for downloading BeerTools Pro and/or updates for it. We will focus on the Saved, Library and Favorite tabs. Saved recipes are recipes that you created using the online tools at BeerTools.com and saved to your personal recipe slots, Library recipes are recipes you added to the online database, and Favorite recipes are recipes that you found in the BTO recipe library and marked as "Favorites". If you are viewing a recipe on the site and don't see the "Add to Favorites/BeerTools Pro" link above the recipe, you need to log in. Once you have recipes in "Saved", "Library", or "Favorites", you are now able to use BeerTools Pro to move them to your computer. So lets move over to BeerTools Pro now. Select "Online" and "My Recipes..." from the menu bar. The window that opens is the view of all the recipes that you have stored in "MY BEERTOOLS". You will notice folders representing three tabs found in "MY BEERTOOLS". Navigate to the desired recipe in "Saved", "Library", or "Favorites". You will notice once you select a recipe, the "Load" button activates. A simple click of the "Load" button and the recipe immediately opens inside BeerTools Pro. So you have access to brewing tools no matter where you are. You can rough out a recipe while on vacation on any internet connected computer, and then open it inside BTP when you get home. In view of some of the previous BeerTools Observer articles you can start to see the power of a brewing eco-system like this. Not only can you work on your own recipes, but you can work with tried and tested award winning recipes! Even better news to the whole story is this is just the beginning! The research and development currently underway in our computer labs will bring even more features to the relationship between BeerTools Pro and BeerTools.com.